PRINCE HENRY, FALSTAFF, POINS, &C.
Falstaff. THERE is a thing, Harry, which thou hast often heard of, and it is known to many in our land by the name of pitch: this pitch, as ancient writers do report, doth defile; so doth the company thou keepest: for, Harry, now I do not speak to thee in drink, but in tears; not in pleasure, but in passion; not in words only, but in woes also:And yet there is a virtuous man, whom I have often noted in thy company, but I know not his name. P. Hen. What manner of man, an it like your majesty? Pal. A good portly man, i' faith, and a corpulent; of a cheerful look, a pleasing eye, and a most noble carriage; and, as I think, his age some fifty, or, by'r-lady, inclining to threescore; and now I remember me, his name is Falstaff: if that man should be lewdly given, he deceives me; for, Harry, I see virtue in his looks. Painted by Robert Smirke, R. A. Engraved by Robert Thew. THE ARCHDEACON OF BANGOR'S HOUSE, IN WALES. HOTSPUR, WORCESTER, MORTIMER, AND OWEN GLENDOWER. Hot. I'll have it so; a little charge will do it. Glend. I will not have it alter'd. Glend. No, nor you shall not. Hot. Who shall say me nay? Glend. Why, that will I. Painted by Richard Westall, R. A. Engraved by John Peter Simon. 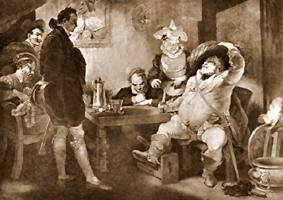 PRINCE HENRY, HOTSPUR, AND FALSTAFF. And food for  [Dies. P. Hen. For worms, brave Percy: Fare thee well, great heart! Painted by John Francis Rigaud, R.A. Engraved by Thomas Ryder.